Another installment in a series of popular arcade fighting games developed by Team Ninja. It is the first installment to be released on Xbox 360. 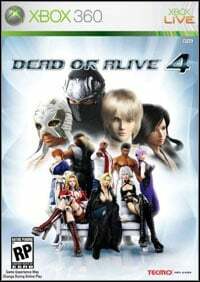 Dead or Alive 4 for X360 is another installment in a series of popular fighting games. The game combines all the advantages of the third installment with DoA: Ultimate. Thus, the player is capable of competing online through Xbox Live for instance. Dead or Alive 4 for X360 features three new characters. Eliot is a male Keii Ken fighter, which is a style based on quick attacks with open palms. A black-haired beauty called Kokoro learned her fighting style from Virtua Fighter's Akira. The third character is a female wrestler wearing a mask on her face. Apart from the new characters, the game offers the already known and popular ones, such as Kasumi or Ryu Hayabusa. In terms of the mechanics, the creators did not stray away from the formula established by the previous installments, so it is an old-school fighting game. Performing counter-attacks was improved, in order for defense to become as much important as attack is. Playing online was improved as well, for the creators implemented a division into clans. Each clan has their own image, colors and emblem. As it was the case in DoA: Ultimate, the players are capable of participating in international tournaments. Dead or Alive 4 for X360 offers improved audiovisuals. The fourth installment supports multichannel surround sound and high resolution settings on HDTV sets thanks to the capabilities of the Xbox 360 console. The fighter models are made of greater numbers of polygons and the engine governs the in-game physics. As usual, multi-leveled fighting arenas were significantly extended. These are full of different surprises, such as cars passing by (the opponent can be pushed into them). Large amounts of different destructible hardware can be found as well. Game score 8.395 / 10 calculated out of 337 players' votes.